Easily one of my favorite films at SXSW 2018 so far. Another sci-fi winner, co-written and directed by Zeek Earl and Christopher Caldwell, who expanded their short story project by the same name into a full length feature film. Prospect somehow successfully takes a small slice of an imagined world by telling the story that starts off with a father, Damon (Jay Duplass brother of Mark Duplass) and his scene stealing daughter, Cee (Sophie Thatcher) who are just trying to make ends meat to pay off impending debt and live their lives. 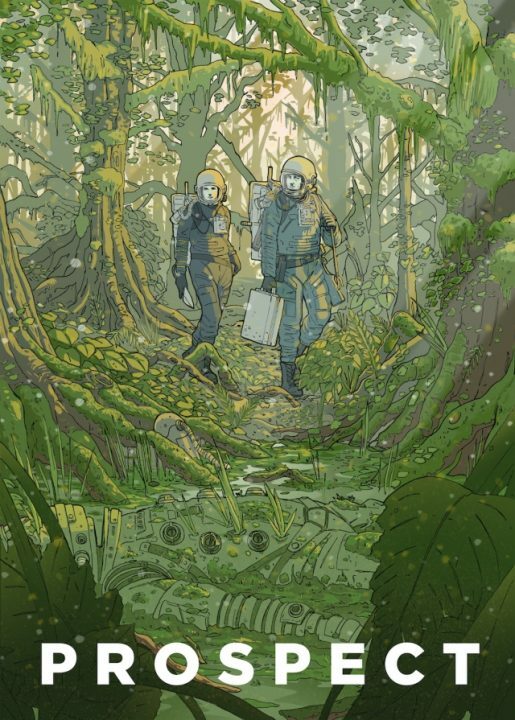 The two travel in a rugged spacecraft to a lush planet with a gorgeously drawn atmosphere with glistening spores, towering trees/forests, and almost an anthropomorphic life to it. Once there, they set off to mine for what could be comparative to the end of the gold rush in the wild west. They are looking for the “Queens lair” which apparently is going to be the payday that they desperately need. Although their goals don’t seem quite aligned, Damon and Cee are bound to one another until they run into a couple of other prospectors on the planet. Things go awry when Damon double-crosses the strangers and Cee becomes entrenched in a survival game. Ezra (Pedro Pascal from Game of Thrones) seems like a dangerous foe, but turns out to be an ally and almost father figure to Cee. Most of the film revolves around their unlikely bonding and the search for fulfillment. Prospect does not have the polished gear we are most familiar from films like Interstellar or even The Martian. The tattered or used up garb is more reminiscent of 12 Monkeys or even 2001: A Space Odyssey. The western feel reminded me of an offshoot of Firefly, even Ezra’s stylized lyricism is not dissimilar to the type of language written for Deadwood. It works for his character and gives him a creepy charm. The juxtaposition between the primary characters and secondary ones that they come across in the film is lovely and the whole world which almost feels contained and yet massive outside of the planet it primarily takes place on, it seems like we are just scratching the surface of the potential for the universe. I was left wanting to see more of the world they live in so I’d say mission accomplished.